A student-led team based in Biology professor Rulon Clark’s laboratory at San Diego State University has revealed how the seemingly defenseless kangaroo rat contends with deadly rattlesnakes. The team used high speed cameras to determine that desert kangaroo rats frequently foil snakes through a combination of unbelievably fast reaction times, powerful evasive leaps, and mid-air kicks. Their work is published in Functional Ecology. The team was able to document these interactions in nature by using radio telemetry to patiently track the hunting behavior of rattlesnakes and place high speed cameras in locations frequented by kangaroo rats. 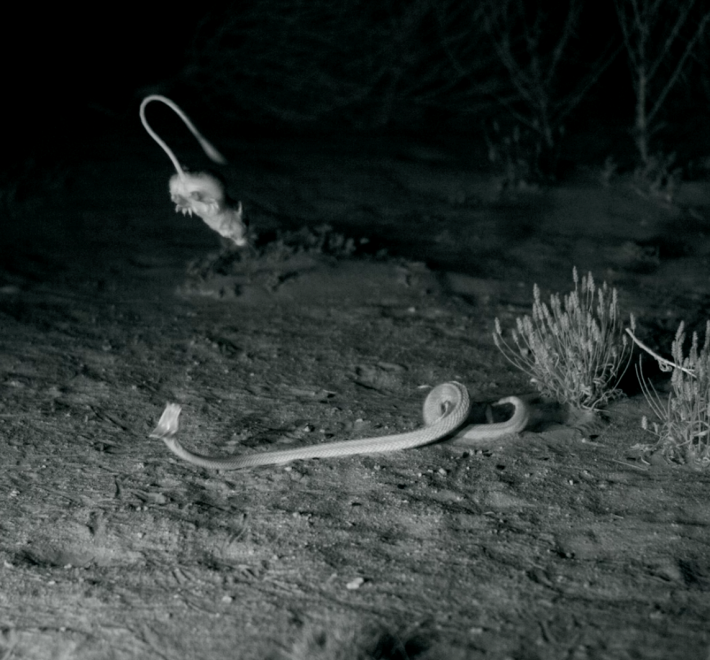 The videos provide the first-ever detailed look at the maneuvers that kangaroo rats use to defend themselves against lightning quick strike of the snake. These defensive kicks solved a mystery that had been puzzling the team for years. Previous research from the group showed that kangaroo rats often seemed to emerge from snake bites unscathed, but it wasn’t clear how. The previous work used lower-speed cameras and so it seemed as if snakes had successfully struck their prey but the movements of the animals were too blurry to see in detail. The new research, done in collaboration with researchers at UC Riverside and the Chiricahua Desert Museum, used cameras with a much higher speed and resolution and showed the kangaroo rats record-breaking reaction times and previously undocumented midair maneuverability. For example, the high-speed footage revealed that kangaroo rats use their long tails to reorient their bodies while jumping, thereby optimally positioning themselves for both defensive kicking and landing on their feet. In order to support their continuing research, the student researchers have launched a crowdfunding effort under the name “NinjaRat”. complete with a cartoon kangaroo rat mascot. They are hoping these new videos garner public interest and kangaroo rat fans willing to donate a few dollars toward generating a deeper understanding of these amazing creatures. Donors to the campaign can get access to additional bonus videos, NinjaRat stickers, and NinjaRat t-shirts. The authors have also published another paper in Biological Journal of the Linnean Society.